Kelowna, British Columbia, February 8, 2018 – An actor, a playwright, a professor and a poet, some may describe Carl Hare as a renaissance man. 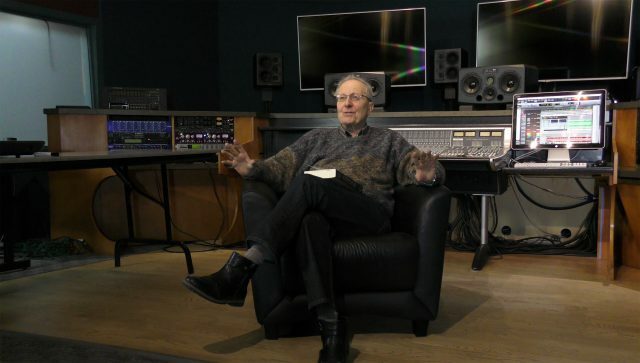 After a long run and distinguished career in professional theatre, Hare has stepped out of the spotlight and into recording studios and writing nooks to pen an epic trilogy that took him on a journey lasting more than two decades. Odysseus: Book I On The River of Time takes readers on a literary and poetic journey where gods and mortals clash. A legendary hero embarks on an extraordinary voyage that tests the human spirit in this harrowing story of survival and courage in the face of defeat, personal triumph and loss. The adventure begins where Homer’s Odyssey leaves off. Not your typical novel, Odysseus: Book I On The River of Time is written in a poetic style reminiscent of the Homeric past. Inspired by a collection of literary works written by one of the greatest poets in the English language, the author explains his inspiration behind the project. “The chance purchase of The Collected Poems of Edmund Spenser in a second-hand bookstore in Winnipeg during a Fringe Festival tour began this epic trilogy twenty-four years ago. Reading the preface of the book, I discovered that the great Elizabethan poet Spenser had written a treatise in essence advocating genocide of the Irish by starvation at the same time as he was writing his seminal work, , designed to be a model for English courtier behaviour. After thinking about this paradox for some years, I began this epic poem to show the huge scope of the problem. The result is a work that spans 3,000 years and explores the struggles of three men from three different periods, written in the styles of their respective periods, to shed light on the sources of this persistent human problem,” explains Hare. The trilogy examines three figures – one mythical, one historical and one fictional, Odysseus in Greece; Spencer the poet, in Ireland; and Archer, a renegade actor/director in Canada. “I’m pleased to see this lifelong project come to fruition. It’s been a journey with many bumps and adventures just like the main characters in the book,” says the long time Kelowna resident. 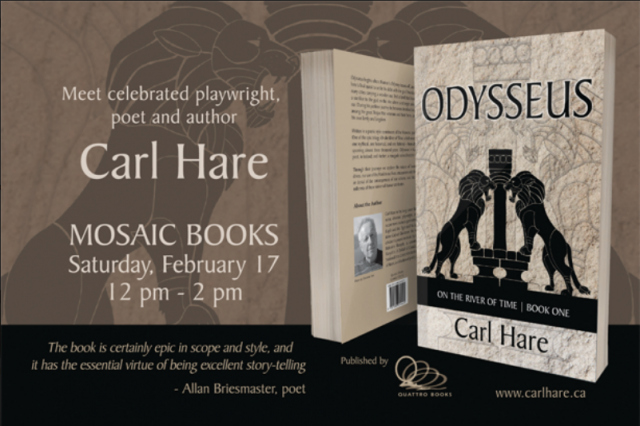 Hare has made Kelowna his home for the last 21 years, where much of his creative and inspirational writing manifested into a literary work that will be introduced at an author meet and greet and book signing at Mosaic Books on Saturday, February 17th at 12 pm. Carl Hare serves on the Faculty of Creative & Critical Studies advisory and community relations board at UBC Okanagan. He has written poems and plays including The Eagle and the Tiger, which have been successfully produced. His children’s poems have been set to music by Canadian composer Malcolm Forsyth and was commissioned from the National Arts Centre for part of the libretto for Forsyth’s A Ballad of Canada, performed to acclaim in Ottawa and on tour in London, UK. He has a degree in English Honours and an MA from the University of Alberta, and a Diploma with Honours from the Royal Academy of Dramatic Art in England. Among his awards are the Rutherford Gold Medal in English and the Sterling Award for Outstanding Contribution to Theatre in Edmonton.